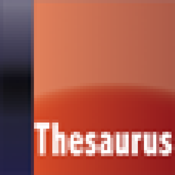 "FreeSaurus" is a no-fuss thesaurus application. It's simple, it's focused and it works. Each definition shows related words, synonyms & antonyms. Make "FreeSaurus" your FREE thesaurus on the go! *** please note this application requires an active internet connection to function. This cleverly titled app provides a great way of being able to expand your vocabulary without having to carry around a thesaurus or dictionary, or having to search the Internet for definitions or alternative words.